Jaitley gave a point-wise rebuttal to the allegations made by the opposition parties with regard to Rafale, Nirav Modi, Vijay Mallya, demonetisation, Pulwama and Balakot incidents. 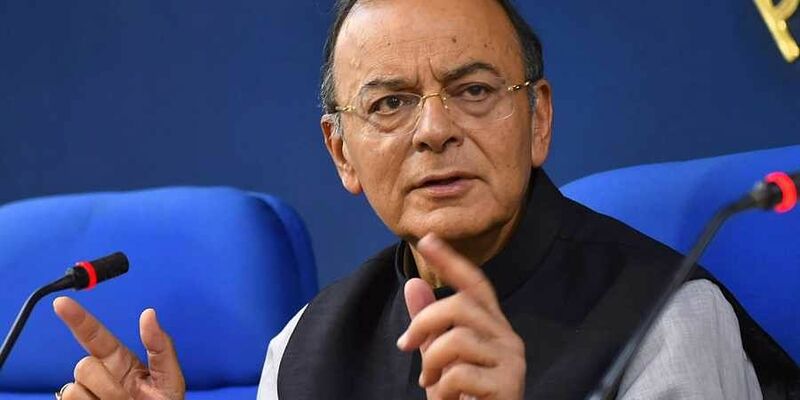 NEW DELHI: Accusing the opposition of manufacturing 'fake issues' concerning Rafale, Nirav Modi and Balakot air strike, Finance Minister Arun Jaitley Saturday said if these were removed from Congress president Rahul Gandhi's speech, nothing would perhaps be left. In the sixth part of his 'Agenda-2019' blog, Jaitley gave a point-wise rebuttal to the allegations made by the opposition parties with regard to Rafale, Nirav Modi, Vijay Mallya, demonetisation, Pulwama and Balakot incidents. "If fake issues are taken out of Rahul Gandhi's speech, nothing will perhaps be left. The Opposition is in a pathetic state." "It has to manufacture fake issues against the Government since the real ones don't exist. The Opposition underestimates the wisdom of the electorate. I am confident that the electorate will respond to India's Opposition parties and show them their place," he said. The senior BJP leader further said it is a recognition of the performance of Prime Minister Narendra Modi's government that the opposition, after five years, has no real issue against the government. The government, he said, is contesting on a pro-incumbency performance platform. "It is a Government with a leader with whom the comfort level of the voter is high. The Opposition is in a state of panic. Its single point programme is a negative one - 'remove one man'," he said. Jaitley said the opposition parties raise fake issues, create an echo effect and then believe their falsehood to be true. On the allegations that the government is politicising a terrorist strike at Pulwama and air strikes on Balakot, the finance minister said, our security forces have liquidated innumerable terrorists in the recent months. The terrorists, however, managed to strike at Pulwama. "Our security forces liquidated the terrorists within days. On receiving information that a very large terrorist camp was being operated at Balakot in Pakistan, the Prime Minister directed the Indian Air Force to strike at the camp. The Indian Air Force did a commendable job. "It was a perfect exercise. They liquidated the terrorists and the camps. They resisted the counter-attack on the following day by the Pakistan Air Force by pulling down an F-16. The Air Force Chief has confirmed this," he said. On issues being raised regarding Rafale jet deal, he said both the Supreme Court and CAG have cleared the deal. The government has saved thousands of crores of the Exchequer in the Rafale deal compared to the prices quoted in 2007, he added. "All procedures have been followed and not one rupee favour has been shown by the Government to any domestic industrialist. Rafale is not to be manufactured in India at all. The Supreme Court has already examined and cleared this aspect," he said. Referring to the opposition allegations regarding Nirav Modi, Jaitley said that he started defrauding the banks in 2011 when the UPA was in power and the crime was detected in 2018 by the present government and its agencies. All his assets have been frozen, criminal cases filed for prosecution and extradition proceedings launched against him. "Some assets are being auctioned. It is only a matter of time before India get him to face the consequences in India. Nobody who frauds India can escape," the minister said. Also, fugitive Vijay Mallya and his company were given loans when the UPA was in power. In fact, banks were directed in 2010 to give a second restructuring of the NPAs of Mallya, Jaitley said, adding that there is documentary evidence which confirms this. "It was on the strength of this restructuring that he got his account regularised and eventually did not pay the bankers. He escaped. No steps against him were taken by the UPA. The NDA have filed civil and criminal litigation against him and succeeded in the extradition proceedings," he said. An appeal against the extradition order is now being heard in the United Kingdom. The senior BJP leader also debunked the allegations that institutions are under "threat" from the Central government. "The real facts are absolute to the contrary. It is the Opposition which has been indulging in a mass-intimidation of the judiciary. They even brought an impeachment motion against the erstwhile Chief Justice of India." "They put pressure on Judges by threatening to walk out of courts along with their allies and lawyer fellow travellers. They intimidate Judges who are not willing to decide in their favour. While the Government and the ruling party have fully respected the Election Commission, it is the Opposition which raised allegations against them," he said. He also trashed the allegations that the Indian economy was in a disastrous situation. "Certainly, the fastest growing economy in the world cannot be in a mess. Our macro-economic data is the most prudent ever. Our fiscal deficit and Current Account Deficit are under control. Our foreign exchange reserves are extremely high. Our revenues have grown exponentially. Inflation is under control," the minister said. Jaitley also dismissed the allegations that EVM machines were being tampered. "In the last two and a half decades, dozens of elections have been held where parties have either won or lost. This is nothing wrong with the machines. "There is a problem with the political losers. It is the same machine with which the Congress party won the recent Assembly elections," he said.